experience with clarity from deep bass to sizzling highs. likely to fall out, freeing you to enjoy your music. 2.Please don't pull hard the headphone cord to prevent breakage. 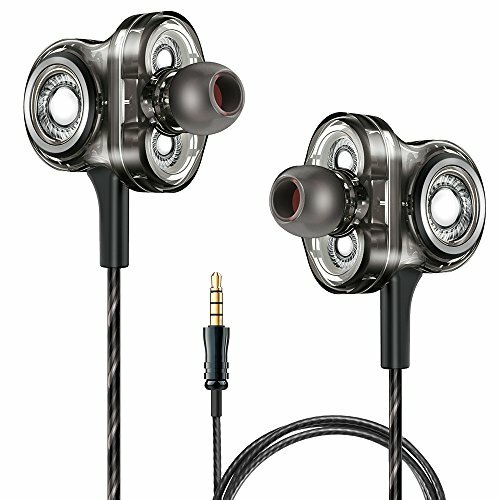 Hi-Fi stereo sound performance: Triple Driver earphones have two dynamic drivers and a separate balanced armature. Deliver an extremely accurate listening experience with clarity from deep bass to sizzling highs. Humanized control：The volume of the earbuds like your smart phones can be intelligent controlled.Built-in mic also allow you to take calls at any time. Noise reduction: In ear wearing design can enclose ear canal which ensuring strong sound insulation effect.Which can be used in aircraft, train, subway and other noisy places. Earplugs are more comfortable : Default earplugs are silica gel. We offer 6 pairs silica gel earplugs and 1 pairs high density memory foam earplugs of different size and type. Wide Compatibility: 3.5mm port compatible with most of the IOS system and Android devices. We aim for a 100% satisfaction rate with all of our customers. If you have any problem please contact us first. If you have any questions about this product by A&S, contact us by completing and submitting the form below. If you are looking for a specif part number, please include it with your message.